When we consider the Wall Street Crash of 1929, we know that behind it was wild speculation on the stock market by a large number of American citizens, who made and lost a fortune. How many of others were there, however, who thought they were trading stocks and were actually being conned by dodgy brokers? 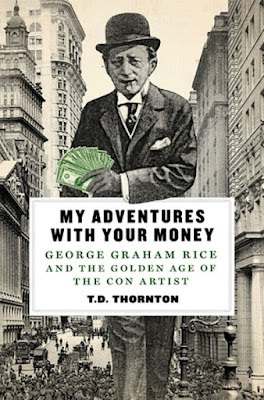 Thornton's book focusses on the history of George Graham Rice, who was vilified as the Jackal of Wall Street and became one of the most hated men in 1920s America as a result of his succession of convincing stock market cons. Thornton's book begins at the very start of Rice's career (before he adopted the pseudonym of George Graham Rice and briefly went by his birth name of Jacob Simon Herzig) and we follow as he begins with early cons, has a couple of stints in prison before emerging - after a successful period as a crooked racing tout - as a unprincipled promoter for mining stocks. There are some excellent stories in here about the gold rush and mining boom towns. One example is Goldfield, Nevada, where Rice organised a prize fight between 2 boxing champions as a promotional tool for the town - the resulting fight, Gans vs Nelson, holds the record as the longest fight in history at a total of 42 rounds. The narrative is evocative and a great insight into the power of promotion, illusion and creative journalism (which Rice used in abundance). The story then moves on to the period of Rice's life when he was a more active name as a broker on the New York stock exchange curb. Whilst this section of the book is full of interesting tidbits - particularly Rice's cunning evasion of justice for significant periods, his colourful and complicated personal life and his flagrant manner of disrupting his own fraud trial - the discussion of the actual stock market manipulation sometimes becomes repetitive. This is not Thornton's fault, but occasionally made it difficult to follow and a little dull. My Adventures with Your Money comes to a close at the time of the Wall Street Crash, and rightly so; this is not only the end of Rice's story but the end of this period of financial optimism in America. The America which lived through the period when men like Rice could make money out of paper stocks for imaginary Death Valley mining towns, came to an end as abruptly as Rice's own career. Certainly, with the hindsight we have, one can see the inevitable coming and Thornton manages to use this to advantage, bringing the book to its expected climax, rounding off both the personal story of the Rice - and of the great age of the Con Man - to a satisfying close. An understanding of the stock market aside, this reader found My Adventures with Your Money to be a very unusual and intriguing book, focussing on the Roaring Twenties from a fascinating new angle.